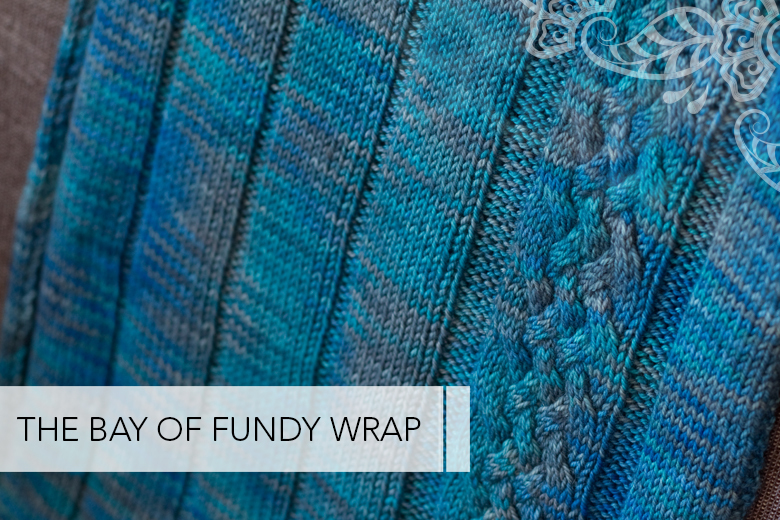 Bay of Fundy Scarf – Free Pattern! 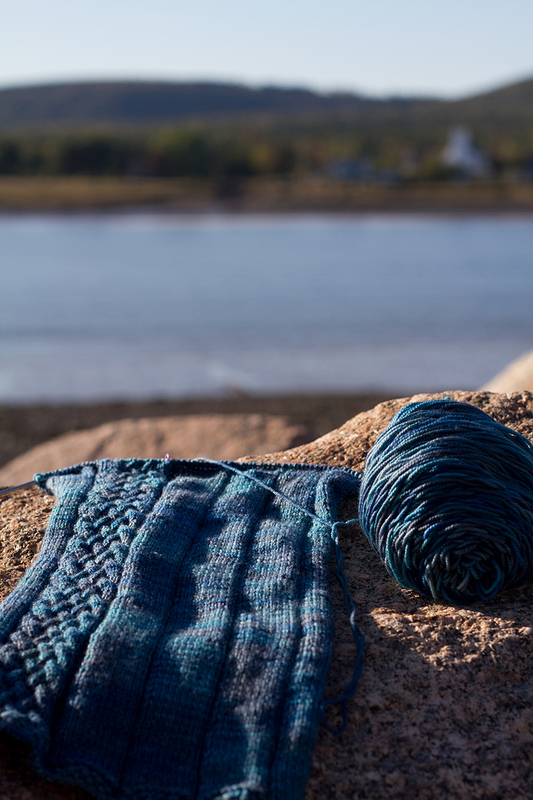 I finally got around to writing down the pattern for my Bay of Fundy scarf – a huge, soft, scarf/wrap that I whipped up on vacation while down east this autumn. Don’t be intimidated by the idea of a scarf on 3.5mm needles, the pattern is pretty mindless and easy (which is what made it a great vacation knit) and you’ll be done before you know it. If you choose the pattern can be easily adjusted to other yarns. 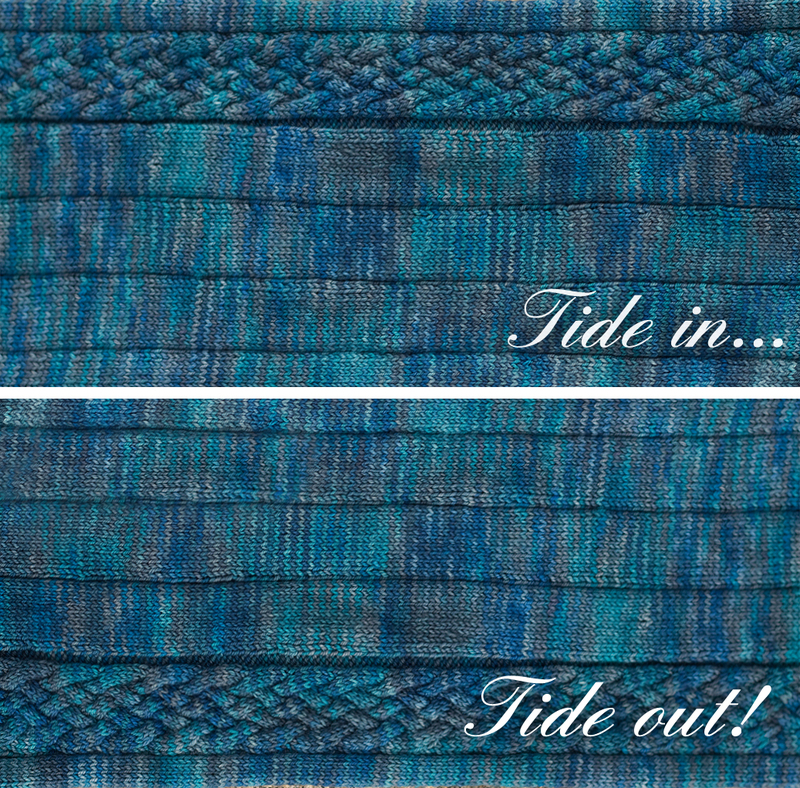 The pattern was inspired by the tides at the Bay of Fundy, as illustrated by my cheesy graphic: Go on and laugh, you know you want to. It was the perfect solution for 2 skeins of TFA Purple label cashmere yarn. 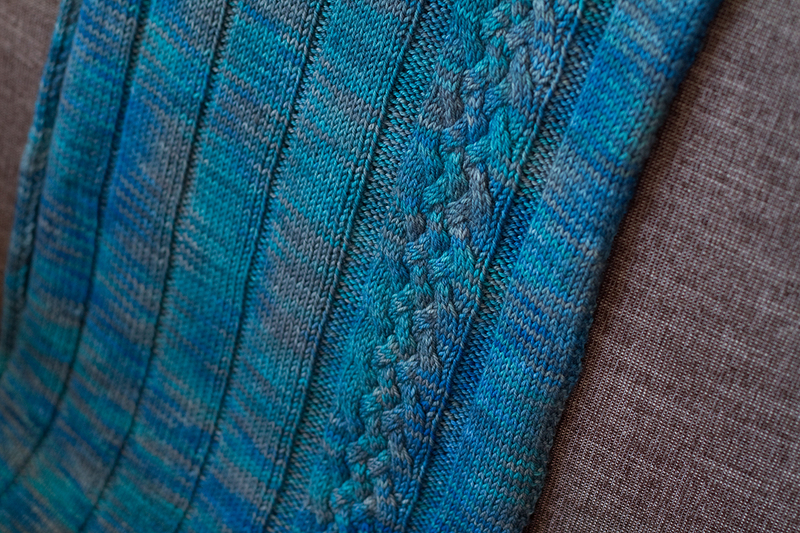 I was lucky enough to get my hands on 2 of her one-of-a-kind skeins at the knitters frolic this year but if you’re looking to match what I’ve done there is a colourway called, appropriately enough, Atlanic, which would do the trick nicely. The scarf was mostly knitted at the Bay of Fundy, of course. Ravelry project page is here. Feel free to email me with any questions. Enjoy! Beautiful Shireen! It looks so incredibly cozy. 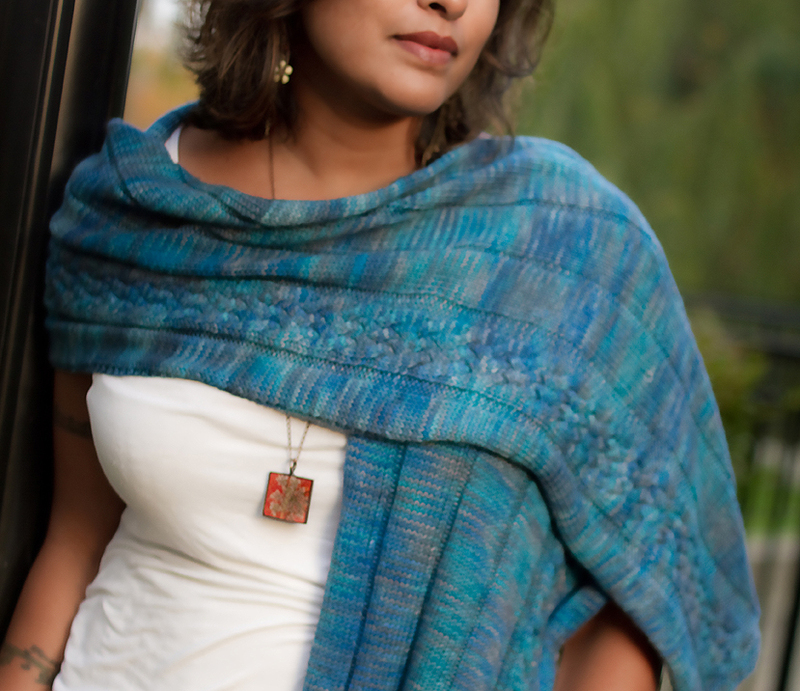 I was searching for a cabled scarf pattern for my daughter and came upon your Bay of Fundy scarf. I absolutely love it. I’ve downloaded it and can’t wait to begin it. I love the Bay of Fundy and was lucky enough to spend some time there a few years back, not once but twice. I and a teacher friend were doing research to enhance our Canada curriculum for 6th graders at our school (in Michigan). I fell in love with the maritime provinces and dragged my husband back the following year. We are now official “wanna be” Canadians. Every year when the kids study Canada I drag out my presentation and show it. I must have 20 slides of the Bay at various heights. It’s also great because I can bring in math and science. What a fantastic place. I usually don’t reply with this much, sorry. I just got excited about your scarf and the Bay of Fundy. thank you for the long reply – I think it’s awesome :) I love the Bay of Fundy and the East coast and it was the perfect place for inspiration. Wow, thats a beautiful scarf, i wish i could knit! Being from St. John, the Bay is my favorite place in Canada and I love hearing about others who are inspired by my “home town”…if you know what I mean? I love this pattern and will be making the scarf for sure. I haven’t been home to the Bay of Fundy in 8 years and I miss it terribly! Nicest people in Canada (I think so, anyway! ), so friendly, warm and open, and some of the most amazing scenery…The Bay of Fundy is just a wonderful place and I’m really happy you both like it so much! God Bless you and I hope you go back and visit again some day! Came across your pattern from Pininterest, and thought immediately of knitting it in TFA yarn…..then to only discover that you did! 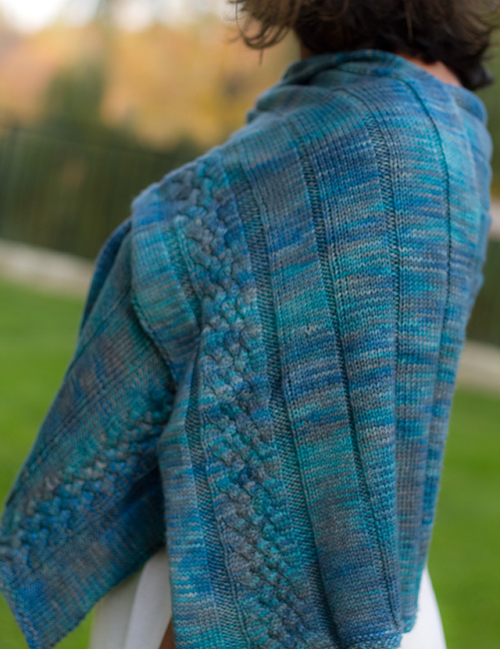 It is a gorgeous pattern and the yarn compliments it beautifully! Haha, I’m a huge fan of TFA yarns, if you end up making one send me pics – I’d love to see! Being a “true Nova Scotian” who lived about a stones throw from the Bay of Fundy I absolutely love this scarf and the colors are gorgeous. I am heading that way in June and do believe I will be taking this pattern along as a project while flying! Thanks for sharing something so gorgeous – don’t see these creations on the bald prairies!! i have the perfect yarn for this, to make for my eldest daughter. Hi Regina! Did you try accessing it through Ravelry?